Egypt is in talks with Israel over Palestinian prisoners on hunger strike, a Palestinian source has told the German Press Agency (DPA). On Wednesday, the agency reported that such efforts were at the request of the Palestinian Authority, which had called on Cairo to intervene diplomatically to secure the release of the prisoners. The Palestinian Minister of Detainees and Ex-Detainees Issa Karake arrived in Cairo last week to discuss the issue with Egyptian officials. Egypt is especially concerned about two Palestinian prisoners, Ayman El-Sharawna and Samer Al-Issawy, who have been on hunger strike for six months. "Egyptian officials delivered a stern message to Israel and warned [the prisoners] could die because of their deteriorating health," the source added. 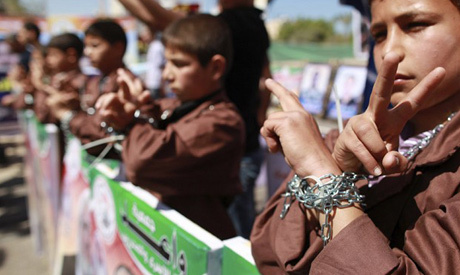 The two detainees were released as part of the prisoner swap deal between Palestinian resistance groups and Israeli authorities in October 2011. However, Al-Sharawna and Al-Issawy have been on hunger strike for around 173 days and 143 days respectively since their re-arrest under the so-called administrative detention law. The law, which has been in place since the end of the British mandate in Palestine in 1948, legalises the arrest of Palestinians if they are a "threat" to Israel's national security. The health of the two detainees is deteriorating and they have recently abstained from drinking water. They are suffering from various health problems, including weight loss, general weakness, protein shortages, sugar shortage, deteriorated visions, and others. The scope of the hunger strike has posed a new challenge to Israel, which has come under international criticism over detentions without trial and could face a violent Palestinian backlash if any of the prisoners die. Karake, himself a former political prisoner in Israel, told Ahram Online in May that almost 2,500 hunger-striking Palestinian prisoners were facing the threat of death. He emphasised the importance of granting prisoners education rights, ending solitary confinement, and recognising them as prisoners of war, not terrorists. Last May, Egypt brokered a deal aimed at ending a hunger strike by 1,600 Palestinian prisoners in Israeli jails, along with another deal in October 2011 that led to the release of Israeli soldier Gilad Shalit in exchange for more than 1,000 Palestinian prisoners.